THE UNDERLINE – MORE TREES PLEASE! You are at:Home»Magazine Archive»Volume XIII»APRIL/MAY 2018»THE UNDERLINE – MORE TREES PLEASE! The benefits of trees are widely known for reducing carbon dioxide and producing oxygen, providing habitat and food for birds, butterflies and other wildlife; and lowering temperatures making urban areas cooler. In 2015, when the master plan of The Underline 10-mile corridor was created by James Corner Field Operations, the plan’s foundation was community input. Over the course of the design phase we had 6 public meetings, had online and offline surveys and reached out to neighborhood and community organizations for feedback. We heard YOU loud and clear. YOU wanted trees and you wanted native species. 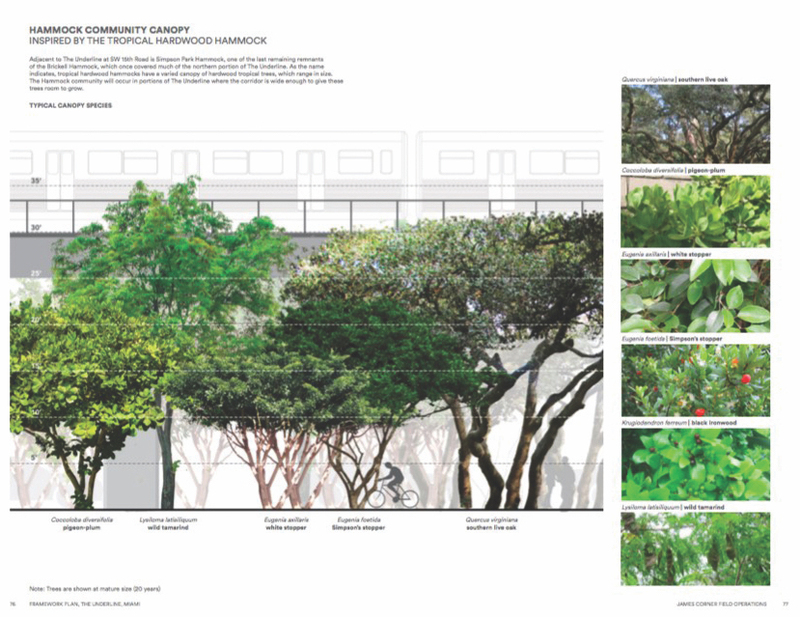 The Underline master plan calls for 4,000 native trees to be planted along the corridor. 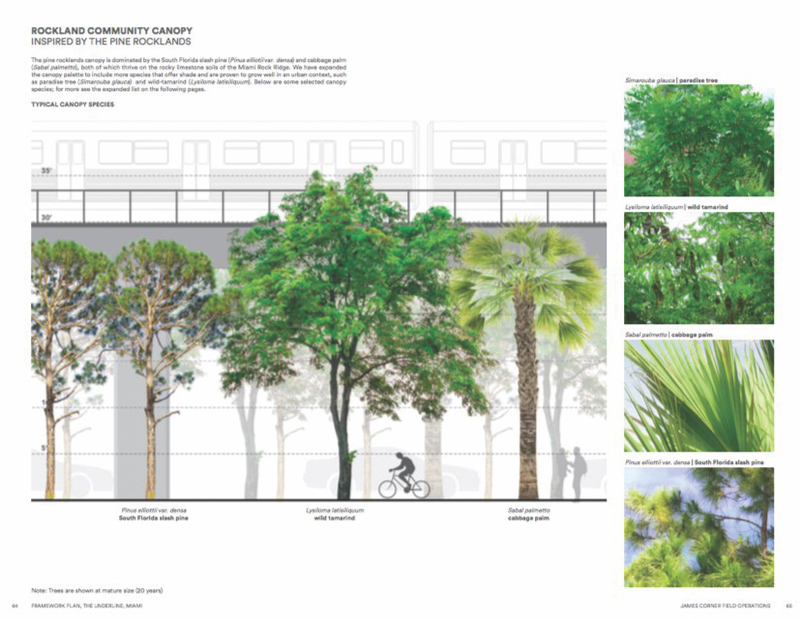 When surveyed, a volunteer team identified the health, size and botanical species of the existing trees in the future Brickell Backyard and University of Miami area so they can be preserved. New trees selected have to be hardy and low maintenance because of close proximity to US1 and near the Metrorail. They must be slow growing to not encroach Metrorail infrastructure. They must be able to survive on the “rock ridge” an oolitic limestone base below the top soil. With these conditions, the design team, with support from Fairchild Tropical Botanic Garden, identified four planting palettes that inspired the tree palette selection: Rockland Community; Hammock Community; River + Canal crossings; Butterfly species and existing vegetation. The Underline trees will include the cabbage palm, wild tamarind, slash pine, stopper species, pigeon palm and live oak. Coupled with native shade tolerant understory species, The Underline will recreate the native ecosystems that painted our community before development and infill. Fast forward to today, Friends of The Underline have partnered with the Nature Conservancy to ensure The Underline’s trees survive and thrive today and for future generations. Volunteer opportunities to plant and maintain the trees and vegetation will create environmental stewardship. Interactive nature walks will educate children and adults on the sustainable significance of trees and the canopy. We hope to be part of a reforestation of the urban core honoring and partnering with leading environmental organizations including The Nature Conservancy. “Trees are an essential component of a healthy, livable community. There is scientific evidence of the benefits of city trees and their cost-effectiveness to reduce urban heat and pollution. This transformational project will provide a unique urban setting for trees to thrive, while providing natural benefits to people, and connecting them directly to nature,” said Temperince Morgan, Executive Director of The Nature Conservancy in Florida.